Dammit I missed it again! As a fan of the Coen Brothers’ films and devotee of their 1998 cult classic, “The Big Lebowski,” I’m thinking next year I have to check out Louisville’s homegrown Lebowski Fest. This year marked the festival’s 13th edition, and was held at Executive Strike & Spare. The weekend event is part movie party, part lawn party, and of course there is lots-O-bowling, as fans celebrate all things Lebowski. Think vintage “Rocky Horror Picture Show” gone festival, with liquor. The Llama is particularly intrigued by the estimated hundreds of gallons of White Russians supposedly consumed. Llamas like White Russians. The film is a noir stoner crime tale, shot as an homage to Raymond Chandler’s detective fiction that offers a view of life through the whimsical, non-judgmental eyes of Jeffrey “The Dude” Lebowski. The Dude abides. Imagine if the floating feather in “Forrest Gump” was human in form – that gets close to how “The Dude” navigates through life. Fans have even founded a religion based off the Jeff Bridges character known as Dudeism. The cast of “The Big Lebowski” is a big part of why people keep returning to this movie. Bridges embodies “The Dude.” Then you have these amazing character actors: John Goodman, Steve Buscemi, John Turturro, Philip Seymour Hoffman, along with Sam Elliott (and his mustache) playing “The Stranger.” Julianne Moore sizzles and Tara Reid naughtily entices. The festival is the brainchild of Will Russell and Scott Shuffitt (retired). Since its beginning in 2002, Russell has staged more than 60 festivals in over 30 cities. Of course there are games, and they are movie-inspired. The scene where Walter decided to throw a “ringer” leather satchel filled with his dirty underwear instead of the ransom money…give that endeavor a try by playing Ringer Toss. Try a game of Ringer Toss to gauge sobriety. 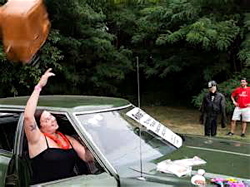 This game requires participants to sit in the passenger seat of a car, and toss a leather satchel filled with who knows what, out the passenger side window and over the hood of the car in an attempt to hit the President Nixon dummy placed on the far side of the road. I would imagine that is quite challenging after a bunch of White Russians. Definitely check out the creative from artist Bill Green, a native Louisvillian who began designing Lebowski Fest’s posters in 2003. Whether slackers, veterans, Achievers, nymphomaniacs, German nihilists, or generic underachievers, they got room for you and all the rest at Lebowski Fest. This entry was posted in Events, Liquor, Reviews, Travel and tagged Bill Green, Coen Brothers, Jeff Bridges, The Big Lebowski, The Dude. Bookmark the permalink.